Some European central banks have reportedly called on Greek bank subsidiaries operating in their jurisdiction to cut their exposure to Greek assets to avoid fallout should the country go into default. The central banks of Albania, Bulgaria, Cyprus, Romania, Serbia, Turkey and the Former Yugoslav Republic of Macedonia have demanded Greek banks’ subsidiaries minimize their exposure to Greek bonds, loans, treasury bills, and deposits, should the talks between Athens and its international creditors fail, reports the Greek newspaper Kathimerini. Greek banks have a large presence in neighboring countries, and the latest ‘quarantine’ is at odds with a recent directive by the Greek government to try and get around the European Central Bank’s prohibition on buying more T-bills. The central banks are concerned that diminishing Greek assets may turn poisonous should there be a banking crisis in Greece. A precedent was set in 2013, when subsidiaries of Cypriot-owned banks in Greece changed hands overnight following the introduction of its bailout program. The media report comes after IMF chief Christine Lagarde warned on Thursday that no delay will be tolerated in Greek repayments. Next month, Athens would need to repay about €1 billion to the troika of international creditors and it’s now struggling to get the money. On April 9 the country repaid €460 million ($493.4 million), despite rumors it would fail and need to leave the eurozone. Greece has already said it will cut government spending aiming to save around €300 million, but it still has to produce a “full list” of planned reforms as demanded by the EU leaders at a summit last month. 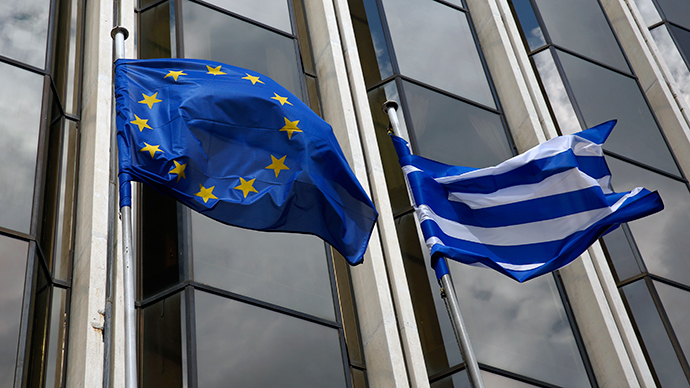 A framework deal between Greece and its EU creditors is due on April 24. The EU wants Greece to introduce more austerity reforms in exchange for €7.2 billion to help its struggling economy, while Athens would like to opt for stimulus schemes to boost growth.